Advance Tabco is one of the manufacturing leaders in commercial stainless steel products. For 85 years, Advance Tabco has been innovating and evolving with the technology to create sanitary and environmentally-friendly stainless steel equipment. If you own or operate a foodservice establishment, then you know that work space is always limited and seems to decrease in availability the more that is needed. 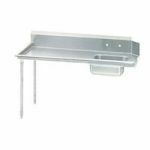 An Advance Tabco Work Table can add a versatile work surface and storage space that will alleviate overcrowding and allow more work to get done. 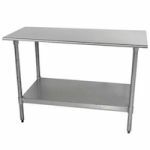 These work tables are constructed from durable 304 stainless steel and are available with and without under shelves or backsplashes. 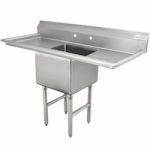 Advance Tabco Dishtables are ideal for any commercial dishwashing settings. Designed to be compatible with dishwashing machines, they are constructed from corrosion resistant stainless steel. 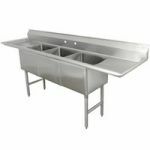 Available in a variety of sizes and configurations, you will be able to find the right dishtable for your establishment. Soil models also include a deep rectangular sink bowl for pre-rinse and soaking. Clean models have smooth tops for drying. Advance Tabco straight dishtables have 10" backsplashes. Corner Dishtables have back splashes on both the table and the return. Island Dishtables have a backsplash on the table and the return is an open table without a backsplash for easy access from both sides of the island.